Your First Finalist for the 2018 Best Book of the Year Award is … T.D. Arkenberg, Author of Two Towers! 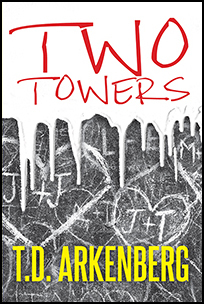 In his poignant memoir, Two Towers, T.D. Arkenberg navigates readers through a personal perfect storm. A resurgence of his father’s long-dormant cancer and chaos at his job in the aftermath of the September 11 terrorist attacks serve as the backdrop for a private struggle with a secret hidden for 37 years.